Upland or moist deciduous forests. The leaf blades are strongly cordate, ± acute in outline, and glabrous. The spur may be shorter in very young flowers than when the flowers are fully mature and the spur is longer than the petals. Plants referable to V. rostrata × V. striata (V. ×brauniae Cooperr.) 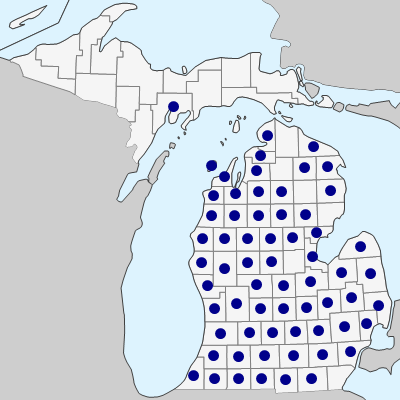 have been collected in Berrien, Branch, Cass, Kalamazoo, Lenawee, and Saginaw Cos.
MICHIGAN FLORA ONLINE. A. A. Reznicek, E. G. Voss, & B. S. Walters. February 2011. University of Michigan. Web. 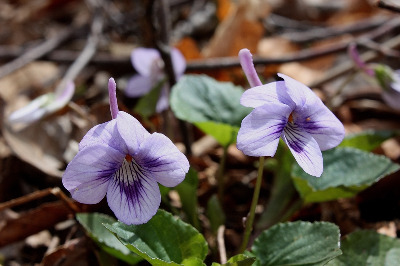 April 20, 2019. https://michiganflora.net/species.aspx?id=2795.